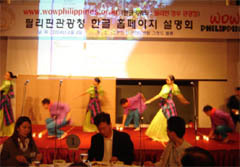 Philippine Tourism Office-Korea launched the Philippine web site promotion event at Inter-Continentel Hotel in Samsung-dong on June 4, 2004. The Philippines has set the target of 370,000 arrivals this year from Korea or 23 percent more than last year's mark. Amb. 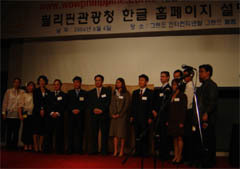 Aladin Gonzales Villacorte of the Philippines told The Seoul Times on June 4, 2004 that he is highly optimistic that participation of a high-powered Philippine delegation to Korea World Travel Fair (KOTFA), which opened in Seoul on June 3 for a four-day run, will help the country reach its arrival target. Attending the official launching event of the Korean-language portal site of Philippine tourism (http://www.wowphilippines.or.kr) held at Grand Intercontinental Hotel in downtown Seoul, Abm. 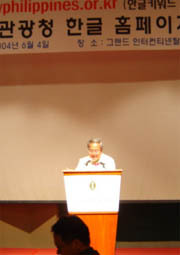 Villacorte said that Korea remains the Philippines' third largest source market in terms of tourist arrivals. He noted that arrivals from Korea recorded a growth of 5.3 percent or 303,280 despite the SARS (Severe Acute Respiratory Syndrome) crisis that hit the region. Philippine Amb. Aladin Gonzales Villacorte delivers a speech. The Philippines participation in the Seoul event will focus on marketing efforts to attract more Korean honeymooners, family and group tours, and company incentives, a spokesman for the Philippine delegation to the KOTFA said. An annual event, the KOTFA has attracted more than 300 exhibitors and over 2,000 delegates from all over the world last year. For this year, the Department of Tourism of the Philippines (DOT) is sending the Bayanihan Dance Troupe for Philippine cultural performance at the main stage of KOTFA and one craft demonstrator to showcase the art of native Philippine embroidery. DOT is determined to further strengthen tourism promotion through projects that will definitely bring in Koreans to the Philippines, according to Mr. Cho Myong-Ho, head of Philippine Tourism Office-Korea in Seoul. The DOT supports the Korean joint community training to include language and cultural immersions and Student Learning English programs. Through these projects, the DOT hopes mutual understanding to benefit both cultures. Likewise, the DOT sees the new PAL (Philippine Airlines) chartered flights from two of Korea's main cities to Manila as opportunities for tourism growth. Ms. Leigh E. Carcel (seventh from left), business manager of Cebu Pacific, and other tourism industry experts pose for a picture. Joining in the Seoul event are representatives from the Philippine travel trade sector-hotels, resorts and travel agencies. Among them are Isabel Paula A. Espina, sales account executive of Bayview Park Hotel in Manila and Alejandro M. Groizard, general manager of Taal Vista Hotel and Mark Raymond A. Ranada, senior sale account manager of Century Park Hotel, to name just a few. "Whether it's business or leisure that takes you to Manila, the Century Park Hotel nestled in the heart of Manila is the hotel for you as it is only steps away from shopping, arts, entertainment centers, historic sites and everything else in between," said Ranada. Century Park is patronized by a growing number of Korean tour groups thanks to its convenient location, superb facilities and hospitality of hotel staff members, among others, said Ms. Kang Jin-Kyung, guest service manager, Korean and Japanese account. The Seoul Times Director Min Byung-Il (right) interviews Kang Jin-Kyung (center), manager of Century Park Hotel, Mark Raymond Ranada, manager of the hotel. They also mentioned the positive image posed by the country as the "least affected by SARS," a major come-on for potential short-haul travelers. In the meantime, the Department of Tourism (DOT) and key players in the tourism industry see former tourism chief and now Senator-Elect Richard Gordon as a new ally in the Upper House. Tourism officials and the private sector are highly optimistic that Gordon will head the Senate Committee on Tourism. Mr. Gordon has been in the industry's frontline for three years. Expansion of tourism budget tops the list of Mr. Gordon who believes that tourism is the fastest way to growth. Mr. Gordon, during his stint at the DOT, has been very bullish in marketing the country worldwide despite meager budget for tourism promotions. Undersecretary Armand Arreza of the DOT Internal Service said that the Department welcomes all the support from the former tourism secretary, especially for a bigger tourism budget. Philippine Amb. 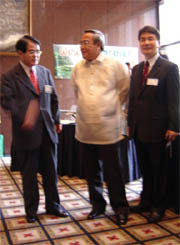 Aladin Gonzales Villacorte (center) talks with Vice President Hong Ki-Chung (left) of Mode Tour while Mr. Cho Myung-Ho, chief of Philippine Tourism Office-Korea, pose for camera. Arreza noted that the Philippines has the lowest budget for tourism promotions as compared to competitors in the South East Asian Region. He cited that the Philippines spends US$ 2 per tourist while other countries in the region spend over US$ 10 each.